Bedarra Hideaway is an architectural masterpiece perched on the Bedarra Island hillside. 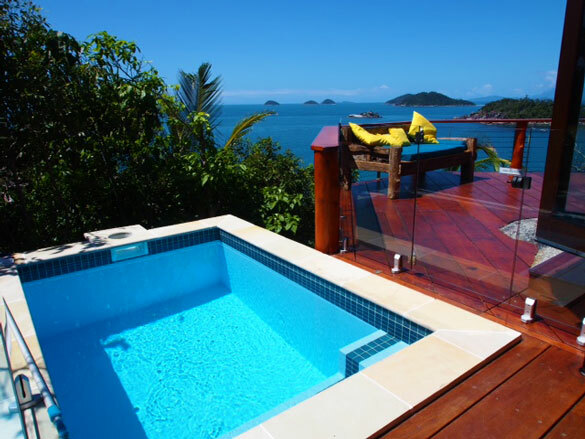 It was designed so that every room, and even the plunge pool, enjoys views across the Coral Sea, the Great Barrier Reef, and Queensland islands including Hinchinbrook Island. You even wake up to these views from your bed! Bedarra Hideaway is surrounded by lush rainforest and is a stone's throw from two secluded beaches of powder-white sand and calm clear waters. These beaches are reached by a two minute stroll down a shaded picturesque path. Bedarra Island has become a favorite honeymoon destination and is one of the most romantic getaways in Queensland. Situated in the tropical waters of Far North Queensland, its a perfect base for Great Barrier Reef holidays on an island so secluded it feels like you have it all to yourselves. Bedarra Hideaway can accommodate one couple, two couples, or a family of four. We care about the environment and use renewable energy, natural spring water, organic recyclable products, and minimise waste by recycling. On Bedarra Island, as you unwind to the rhythm of island time, you will find joy in the simple pleasures – a walk through the cool rainforest on one of the hiking trails, sleeping on a secluded beach to the sound of the Coral Sea lapping on white sand, a swim in the calm waters where you might see a turtle or dugong, snorkeling, kayaking, fishing, a dip in your personal plunge pool where you can enjoy amazing views across the Great Barrier Reef and its islands, or a picnic, sundowner, or moment’s meditation on one of the spectacular look out points. If you’re itching to raise the adrenalin, there are a host of adventure activities on your doorstep, too – scuba diving on the Great Barrier Reef, charter fishing, sky diving, and helicopter tours. We're happy to help you to organise this and any other activities that interest you before you arrive on Bedarra Island. Please make enquiries to Sharon by email or phone (07 4067 5311 or mobile: 0408 903 104 or international +61 7 4067 5311).